1 Btl. 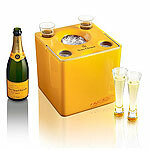 Veuve Clicquot Yellow Label N.V.
2 Champagne Flutes including Clicquot Logo. The Ice Cube is a new product for 2009 designed in association with Porsche Design, it holds 1 bottle of YL and 4 trendy flutes. 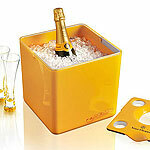 The "cube" itself functions as an ice bucket incl. Handle and Lid. Concept and idea for use is that people can enjoy chilled VC at summer events, take it with them on picnics, outdoor concerts, etc. 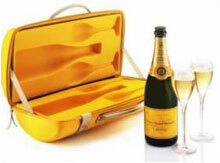 Clicquot Ice Jacket (for cooling your Champagne ). 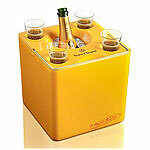 Clicquot Ice Box (to chill your champagne). Have you seen the City Traveller from Veuve Cliqout?